The discord utility of LabyMod allows users to utilize the Discord Rich Presence feature. The user can then share his current server and game (for example the specific lobby he is on) using Discord. 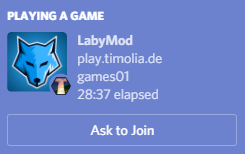 LabyMod is directly connected to the Discord API and serves as a bridge between the Minecraft server and Discord. The communication is done using the plugin message channel LMC with the key discord_rpc. spectateSecret: This is the secret that a user needs to spectate a game. All required id's or secrets must be specified in UUID format. Discord is distributing the secrets to the friends of the users, and when a friend chooses to spectate his friend through Discord, he is submitting that secret to the gameserver himself to authenticate itself. This means the server has to remember the active secrets it sends out so it can match them to the player and action they correspond to, so the friend can either join the game, the party or start spectating. // Do make sure there is proper error handling in place. Client may send secrets that are not in UUID format! You can send also a party invitation to other Discord users with the party information.